JIG completed another training course this month in Abu Dhabi, taking the total number of attendees to 38 so far. 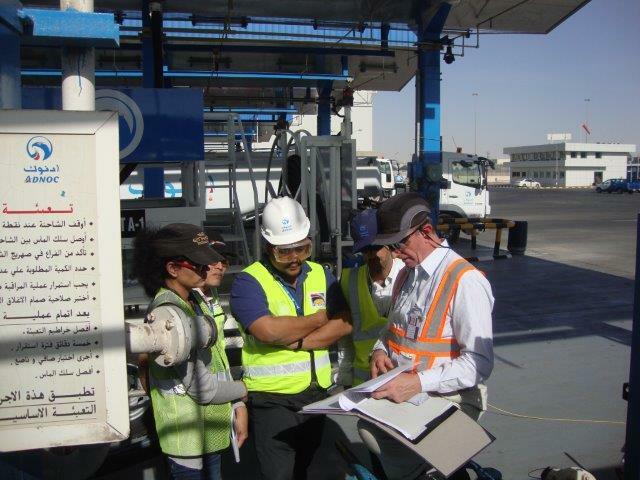 The training was held at the ADNOC depot and training facility near Abu Dhabi International Airport which was excellent for both the facilities in the classroom and the access to the depot and into-plane activities. The hospitality shown by Mr Al Ansari and the ADNOC staff was outstanding and made the long training days comfortable and worthwhile. We look forward to returning for a future training course. The course was attended by 12 participants from JIG Members around the region and further afield, and we were delighted to have one of our newer Members, Reliance, as well as a representative from Etihad Airways, part of our ongoing cooperation with IATA/IFQP. There were two new trainers involved in this course, Dan Kadlecek from ExxonMobil and JIG’s Technical Manager, Tony Rowe, both of whom are current JIG Inspectors. It was a relief that they both passed the exam with flying colours! We will be working with the JIG Operations Committee in January to review the course materials and processes, to ensure that we build in any feedback received from JIG Members and participants, and we intend to liaise with the Workshop Committee to plan the calendar of Training/Workshops for 2015/16. Demand continues to exceed the places available and we would encourage you to indicate your interest as early as possible. Unfortunately, we have had some unavoidable cancellations where it was too late to allocate the place to another candidate. As JIG is looking to recover costs for these courses, we are impacted by the loss of course revenues when this happens and will be introducing a deposit once we indicate an acceptance to the course. We appreciate that early notification is important for budgets, travel and visas so we will be trying to notify candidates of their place on the courses as soon as we have approval that they meet the criteria for entry. We are hoping to have at least 3 training courses in 2015 in locations where we believe there is Member demand.